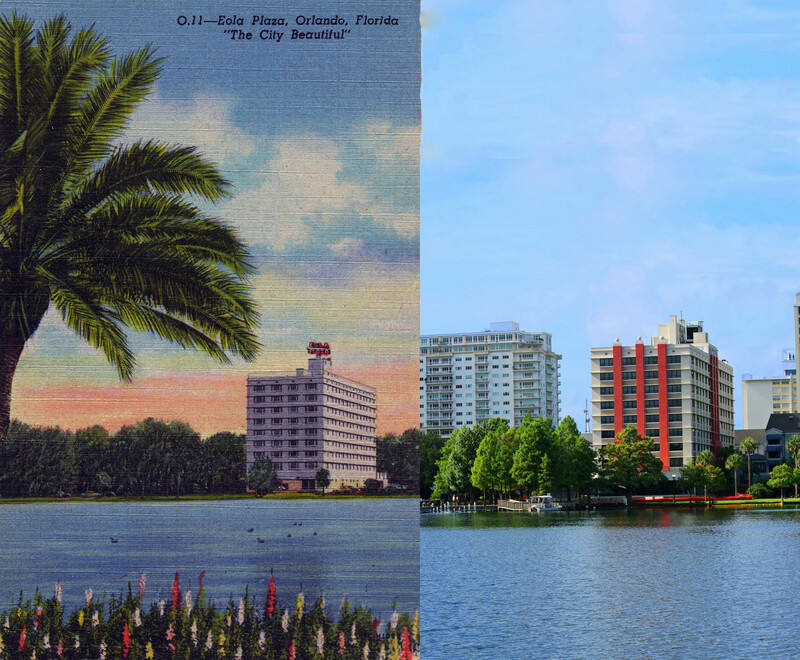 The Eola Plaza in the early 50’s and the shores of Lake Eola 60 years later. This is story of apartment building (Eola Plaza) turned hotel (Cherry Plaza Hotel) and then turned back to apartments (Post Parkside). In 1950, a new, modern high-rise dominated the shores of Lake Eola. That year, Eola Plaza opened as one of the tallest buildings in the area and one of the first built with poured concrete. The surrounding area was largely two-story homes at the time. That soon changed as many of which became shops and inns when tourism and traffic increased. Eola Plaza offered more than just apartments, but brought commerce to the area. Storefronts were on the street level of Eola Plaza. In a 2000 piece in the Orlando Sentinel, Joy Wallace Dickinson listed those early 1950’s businesses as being Eola Pharmacy, Plaza Petites, the Eola Plaza Flower Shop, Jeanne Elkins Dress Shop, Markham’s Restaurant, the Mary Bradshaw Beauty Salon, and The Eola Plaza Bamboo Room, a night club. In the mid 50’s, William Cherry, chairman of Cherry Broadcasting company, owned radio stations WDBO-FM and WDBO-AM and WDBO-TV (currently Channel 6). He added this building to his portfolio, and the Eola Plaza became the Cherry Plaza Hotel. A 1200 seat convention facility, which included the Egyptian Room, was added making the hotel an attractive location for out of town groups and local community events. Its time as the Cherry Plaza was the hotel’s most interesting. In the 60’s the hotel was in its prime and important guests visited and the many notable events were held in the Egyptian Room. One of these events could be considered Day One of Orlando becoming the world’s family vacation capital. Long before Walt Disney World was planned, the New York Times wrote about growing tourism in Orlando. Noting that over a quarter of a million people flew into Orlando in 1959, a 26% increase from the year prior. The number of hotel rooms in town had doubled in two years to over 1800. The Times wrote that more hotel rooms were added to Orlando when, during the conversion to Cherry Plaza, some Eola Plaza apartments were divided into multiple hotel rooms. President Johnson was the first U.S. President to spend the night in Orlando while in office, and he stayed at the Cherry Plaza in 1964. The Jones High School Band were part of the welcoming festivities. Greeted with a large crowd in front of the hotel, LBJ climbed onto the hood of a police cruiser to announce how happy he was to be in Orlando. That visit wasn’t LBJ’s first visit here. As a senator and a Vice Presidential candidate running with John F. Kennedy, he hosted Democratic campaign workers at a luncheon at the Cherry Plaza about five years earlier. 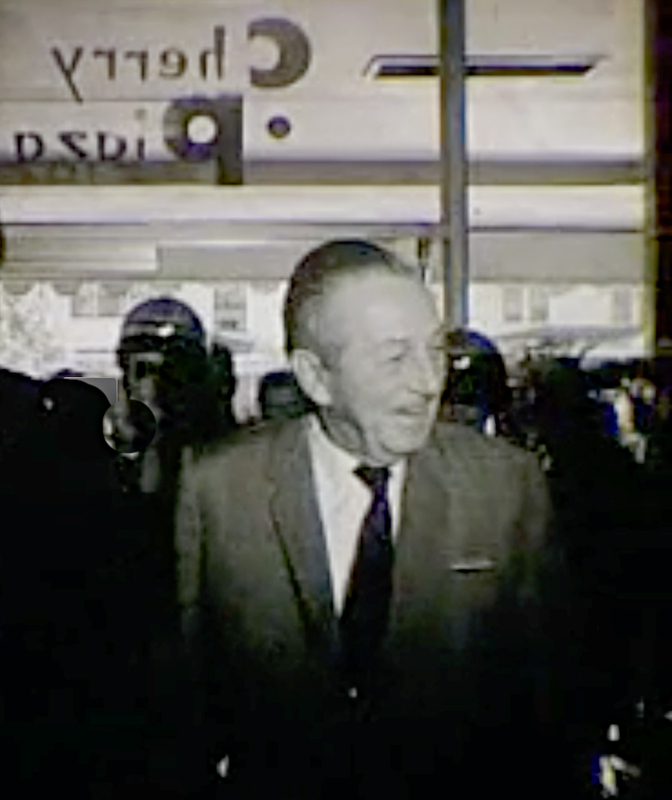 Walt Disney walking into the Cherry Plaza to make an announcement that would forever change Orlando. In 1966, actor Danny Thomas hosted a reception in the Egyptian Room at the Cherry Plaza. Thomas was one of the original owners of the Miami Dolphins and had the players in Orlando for an event. He was in town building excitement about the new Dolphins, Florida’s first professional football team. The event with the greatest impact on Orlando was a November 1965 press conference also held in the Egyptian Room at the Cherry Plaza that included Walt Disney, his brother Roy, and the Governor of Florida, Haydon Burns. This was Walt’s only public appearance in Orlando. After secretly purchasing land in Central Florida, he announced plans for Disney World. He promised attendees that it would be grander than Disneyland and would employ 4000 people. Disney died a little over a year later without seeing the growth his announcement brought to this community. For a few years in the 1970’s, there was a Columbia Restaurant, part of the oldest restaurant in Florida, located in the Cherry Plaza. The family that owned the now 105 year old restaurant said a church objected to liquor sales and forced is closure. Later, Lee’s Lakeside opened in the same restaurant space overlooking Lake Eola. Restaurateur Lee Rose ran this local favorite for over 20 years. Lee’s Lakeside closed in 2005 not long after her death. The Cherry Plaza Hotel’s story was too much for one blog post. The next post to Orlando Retro will be about the Cherry Plaza Hotel’s role in a part of Orlando history that is remembered with less delight than Uncle Walt’s visit.